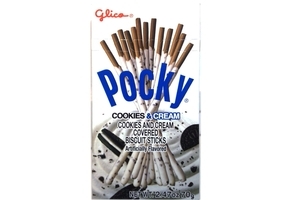 Glico Covered Biscuit Sticks Cookies and Cream in 2.47oz (70g) box. Pocky are tasty crunchy biscuit sticks coated with delicious creamy glazed frosting, with gaps at the ends just big enough for you to hold them without getting sticky fingers. This new fancy Cookies & Cream variety features cocoa infused biscuit sticks coated in milky cream frosting, embedded with crushed little bits of chocolate cookie. The overall effect is like eating Oreo in stick-form delicious! These are slightly less chunky than their Pepero Cookies & Cream counterpart, but you get many more in the pack. This Pocky comes in neat easy-to-open packaging. They are very moreish, but at this everyday low price you can afford give in to temptation and treat yourself or your friends! Product of Thailand.